The synapsids split from the sauroposids (anapsids+di-apsids) in the Mid-Carboniferous, and they expanded in diversity enormously during the Permian, becoming the dominant land animals. The clade is generally divided into two groups. The 'pelycosaurs' (Romer and Price, 1940; Reisz, 1986) are a paraphyletic group of six families of basal synapsids that were particularly important in the Early Permian. These were succeeded in the Late Permian by the Therapsida, a diverse clade of small to large plant- and flesh-eaters (see Box 5.3). (Figure 5.12(b-d)). The skull is relatively very large. It has a long, high narrow snout region that makes up three-fifths of the total length, and the orbit and temporal fenestra are small and placed high. The limb bones are massive. Ophiacodon was a meat-eater, and it may have fed on fishes and tetrapods rather than mainly on insects. The eothyrid Eothyris, a small animal from the Lower Permian of Texas (Figure 5.13(a)), has a low skull with a much shorter and broader snout than that of Ophiacodon.The two caniniform teeth are very large, and Eothyris was clearly a powerful predator. 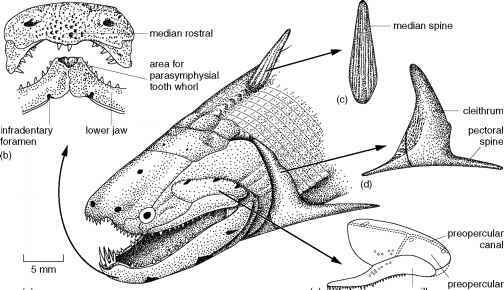 level of the tooth rows, an adaptation that shifts the maximum bite force to the cheek teeth; the jaw could probably have been moved fore-and-aft;and the barrel-shaped ribcage presumably contained massive guts that were necessary for digesting large quantities of rough plant food. The varanopids, six or seven genera of small carnivores known until recently only from the Lower Permian of North America, survived into the Upper Permian in Russia and South Africa (Modesto et al., 2001). The limbs are long and the skeleton lightly built, so that they are interpreted as active and agile in their habits. 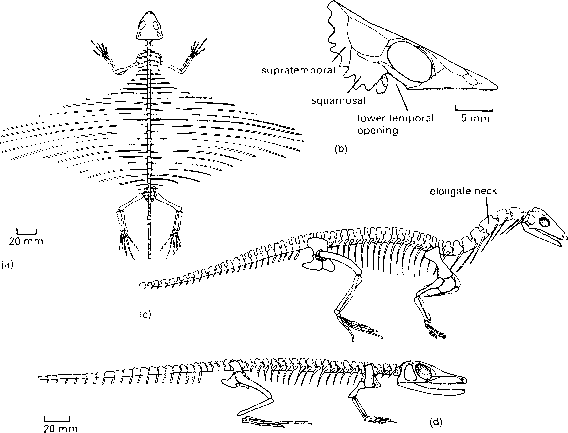 Varanops (Figure 5.13(e,f)) has a long low skull, with the dentition extending unusually far back to lie below the temporal fenestra.